Healthy Habits – We believe that posture and alignment are the root of lasting physical improvement. Healthy Habits philosophy is based in correcting towards optimal posture. WE believe that even small misalignments of spine and joints can and do cause pain and impede organ function, sports ability and normal gait. 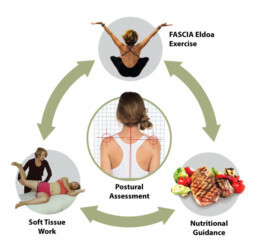 We Integrate functional assessment, connective tissue fascial exercise and osteopathic manual therapies with detailed nutritional guidance and detox kits to create a permanent physical change. Posture is the key to pain management and peak performance. Fascial Yoga is a form of exercise that emphasizes the importance of diaphragmatic breath, coupled with very specific positions of the body that address tension in the complex and interwoven fascial system, while conditioning the muscles below. These poses help to decompress tensions along the spinal column, joint lines and through the 5 fascial lines, allowing the fascia to glide and slide over its many layers. Through continued practice, fascial yoga can help to ease pain in aching joints and open up artery and venous flow, increasing overall circulation. Fascial yoga focuses more on the body’s optimal ranges of motion through the joints and fascial lines, and not just on flexibility. They key is in length and strength, not on how much you can bend. Fascia is a connective tissue. It holds joints and muscles in place. Fascial training is about helping to mold fascia to make space along every joint in the body. Regained joint space changes posture and allows for one to absorb impact better, improve joint pain such as osteoarthritis, and avoid injury from sports or regular movement patterns. It is the most highly innervated tissue in the body. Our training programs at Healthy Habits aim to improve the quality of fascia and posture which is held by fascia. Fascial training responds to hands-on manual therapy followed by specific exercise that open the joint line allowing the supply of blood, nerve, artery and vein to improve. Fascia has been mapped throughout the body. Below are three general fascial line sketches that show how fascia connects distant parts of the body into one cohesive line of connective tissue. Through this we see how ones pain can be distant to an injury as tension impacts an entire fascial line. Eldoa exercises are specific to the Osteopathic philosophy. Eldoas and fascial stretch are exercises that decompress tensions along the spinal column fascia, from the cervical spine to the sacrum. By putting the body in specific positions under precise tension allows the fascia to glide and slide over its many layers opening each segment. This allows for much improved nerve supply to organs and the periphery. Clients FEEL different after every session. They feel smoother in their motion, more spring in their step and lighter in their overall physique. Fascial exercise is deliberate and results oriented, every time you do it. 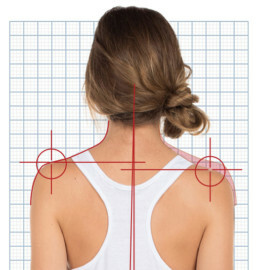 An assessment of posture informs the practitioner which issues in the tissues to address first. Compressed joints and restricted muscles work to limit agility and physical ability no matter what age a person is. There is a pattern to ‘unwinding’ tension in the body to optimize the permanent physical change. We take a look, take a photo and then start addressing the restrictions. Osteopathic and myofascial manual techniques are used to redistribute tension in the connective tissue. Clients move between exercise and tissue work during a session. Hot moist heat and laser therapy is also used to treat chronic or acute issues. All of our practitioners are certified low intensity laser therapists. Our nutrition program is on-going delivering individual recommendations at a pace that new habits can be integrated. We find out what your food sensitivities, allergies, hormonal triggers could be then design an optimal pattern of eating for your lifestyle and physique for long term improvement. 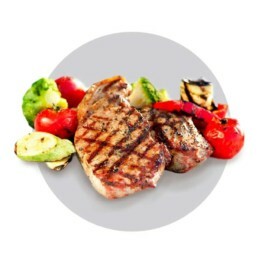 WE have for years trained clients and athletes in ketoneogenic diets, gluten free, and anti-inflammatory diets. We offer monthly detoxification kits for 3-5 days in length. These are a popular tool to help decrease inflammation and improve joint pain, stop negative eating habits, and as a weight-loss kick start.